Friday I experienced another really fun day shooting videos for ModernMom.com's YouTube Channel, which launches in April. 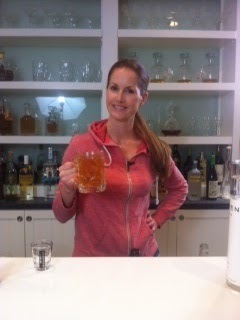 My little cocktail segment is titled Let's Mix and I cannot wait for you to see it! I'm positive that you'll be whipping up these drinks with ease at home in no time. I was able to arrive a little early yesterday and caught the tail end of the cooking segment, similarly titled Let's Cook, starring the very talented Michelle Karam. The moment I stepped out of my car I was enveloped in the aroma of heavenly cooking pouring from the house. Inside, the beautiful kitchen counters were covered with freshly baked and picture perfect dishes, begging me to swoop in with an over-sized fork. I seriously regret not showing up hours in advance to study the chef's every move. But I guess I'll have to wait to wait for the videos like the rest of you! 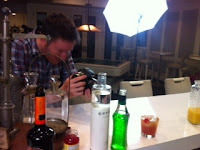 For my portion we got to film in an actual home bar, which was really exciting. Between the hum of the ice machine and the beer on tap, I felt like I was right back in one of my favorite stomping grounds. Oh, and of course being surrounded by alcohol always gets me in the right mind set for mixology. Some people have asked if I get nervous making drinks in front of the camera, but since most of the focus is on the drink, it's easy to stay relaxed. After every take the director would zoom in "for the beauty shot," which meant getting up close and personal with my cocktail. She's definitely the star of the show, and I'm happy to give her the limelight!